commodore pet 2001 advertising literature. 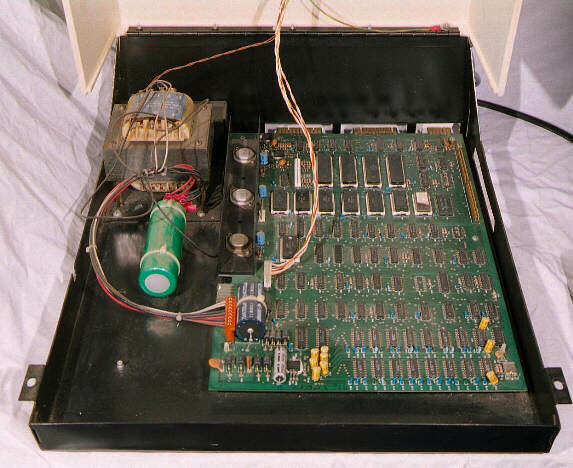 Intel produced the world's first microprocessor, the 4004 in 1972. 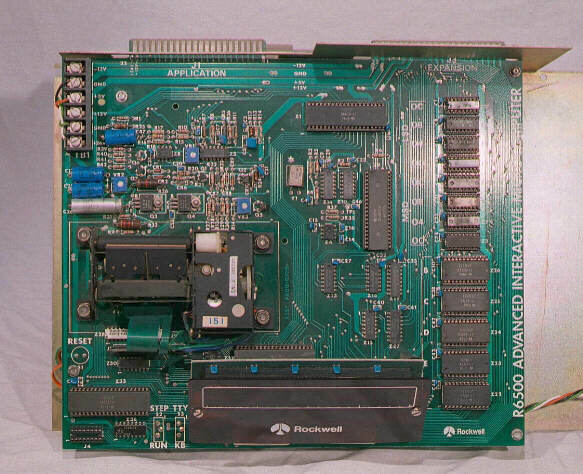 The success of this led on to the production of the Intel 8080. By the time the 8080 was being produced, other manufacturers had caught on and started producing their own designs. 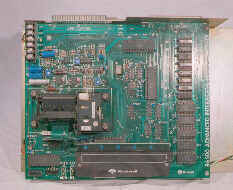 Motorola produced the 6800 and a group of ex Motorola engineers founded MOS Technologies and started to produce the 65xx series of chips, which were designed to be bus compatible with the 6800 series of devices. 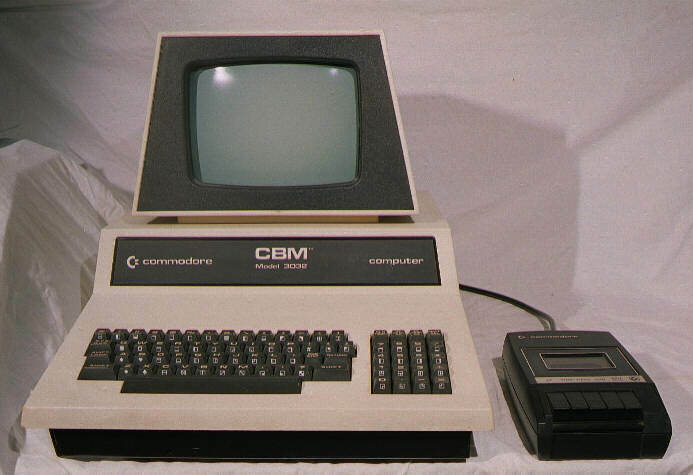 The 65xx series was very successful, partly because of its initial relative cheapness and was widely adopted, perhaps most famously by Apple, but also by Commodore and Acorn. 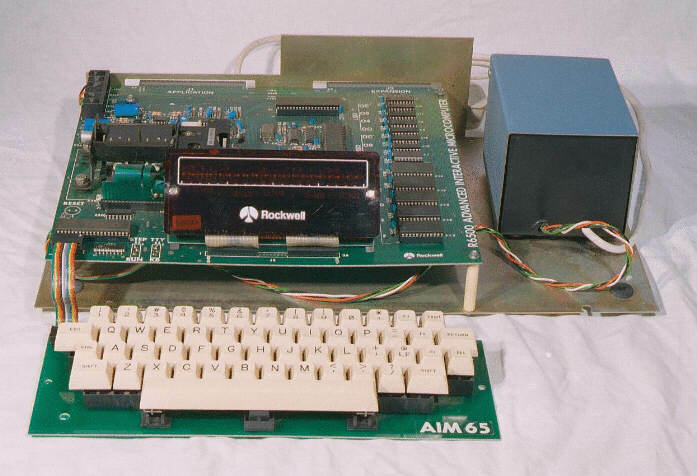 The Rockwell AIM65 was intended as a development system or as a stand-alone computer system. 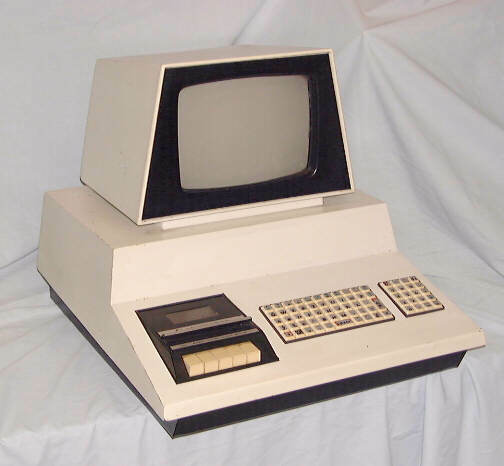 It uses a 6502 microprocessor and came in 1KB and 4KB RAM versions with a simple monitor in ROM. 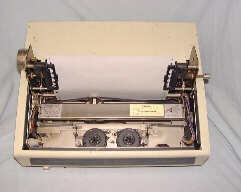 A 20 column thermal printer was fitted as standard and a 4K assembler and 8k BASIC Interpreter were available as optional extras. The machine illustrated has both these options and 4K of memory. The 4K RAM is on the upper right of the board (8 chips), below this the 5 ROM chips for the BASIC Interpreter, Assembler and the monitor. 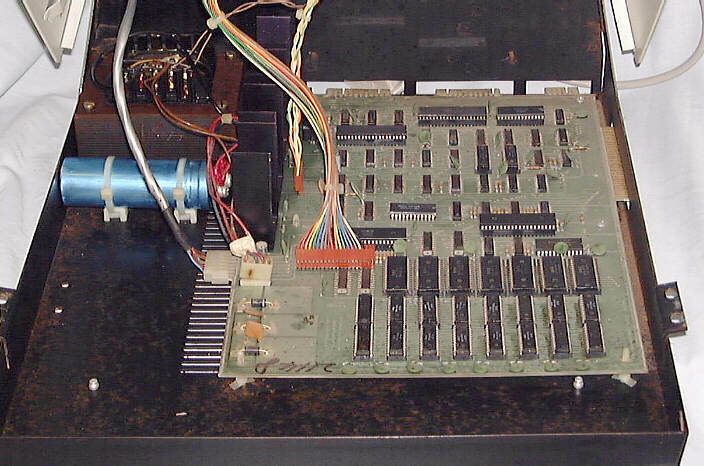 The 6502 CPU is at the rear of the board, to the left of the RAM. 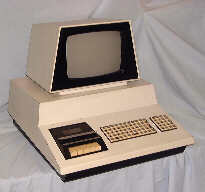 The Personal Electronic Transactor (PET) was available in 4KB or 8KB versions. Early machines were fitted with static ram, which was notoriously unreliable. This would pass the initial memory test when the machine was turned on and then fail a few minutes later as it warmed up. The computer had a calculator style keyboard, which was difficult to use and also quickly lost all traces of lettering from the key surface. The small keyboard gave sufficient space to allow a cassette drive to be fitted into the base unit. This particular example has had quite a hard life, the keys have lost their original surface and the characters have been re-applied with a stencil. At some stage, the sticky label proclaiming it to be a PET has been removed. 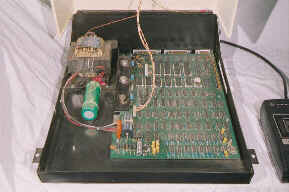 The Pet 2001 opened showing the circuit board and linear power supply. In the front of the PCB are sixteen 6550 static RAM ICs, giving 8KB memory. Behind these are seven 6540 ROMS holding the OS and BASIC, behind these are a 6520 interface adaptor on the left and on the right is the 6502 CPU. Towards the rear of the PCB is another 6520 and in the centre a 6522 versatile interface adaptor. 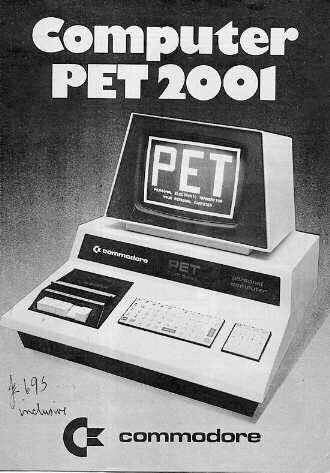 The front cover of a brochure for the PET, with the UK price written on it - £695! 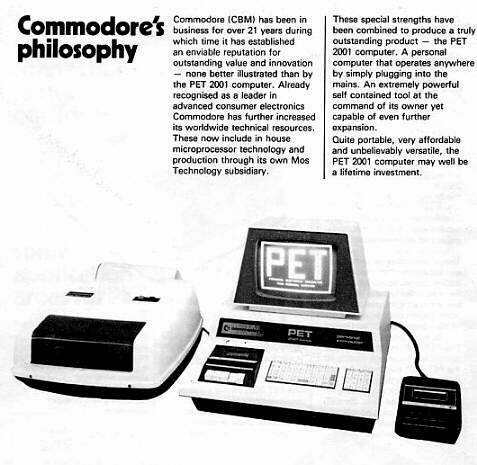 The back cover of the brochure illustrates the PET with its two cassette units and a printer. As far as I am aware, the printer illustrated was not sold, at least not in the UK. 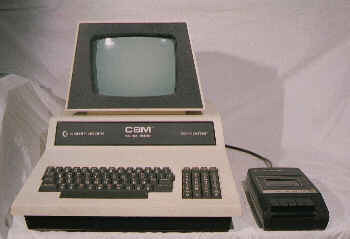 This CBM 3032 is a successor to the Commodore PET, it has a bigger keyboard and 32KB dynamic RAM memory. 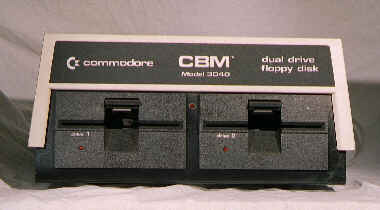 The larger keyboard means that the first cassette drive now has to be an external unit. Although the keyboard is a more conventional size than the original PET, it still retains the PET's quirky arrangement. Characters such as ", $, (, *, etc, which are normally shift characters, are typed directly on the PET. The shift key either produces Commodore's graphics set or lower-case characters, depending on a bit pattern set in the peripheral control register of the 6522 Versatile Interface Adaptor chip. Infuriatingly, the keyboard lacks a CONTROL key. Commodore tried very hard to rid themselves of the PET image, with all products being referred to as CBMs rather than PETs. 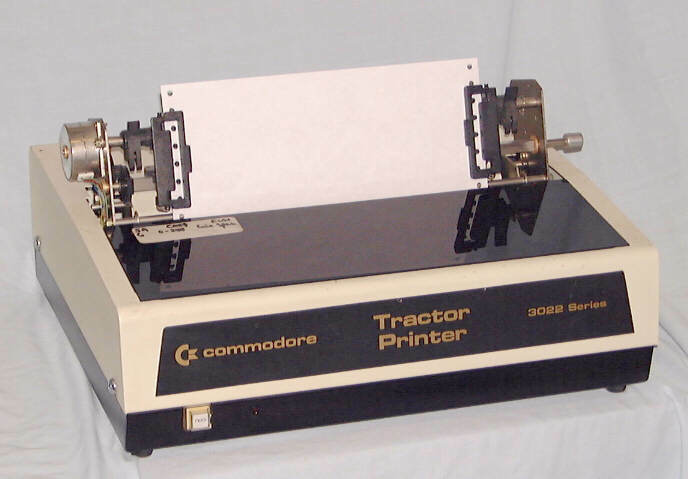 Users, of course, continued to refer to the machines as PETs. The unit opened, showing the linear power supply on the left. At the front, the RAM (with blue decoupling capacitors). At the rear are four 40 pin chips, from left to right two 6520 PIAs (Peripheral Interface Adaptors), a 6522 VIA (Versatile Interface Adaptor, more complex than the 6520 and widely used) and at the right the 6502 CPU. In front of these are from left to right the five 28pin ROMs of the operating system and BASIC with 2 additional add-ons at the right. These two were third-party chips which added extra functions to the operating system. A early Commodore printer. This type was soon replaced by the 4022 series, which were much quieter. When operating, this printer makes a noise which can only be described as excruciating, the resonance of the thin metal casing does not help. In common with some other printers of this date, the 3022 and its successor, the 4022, did not print descenders. The characters gjpqy were reduced in height so that all characters fitted to a common baseline. 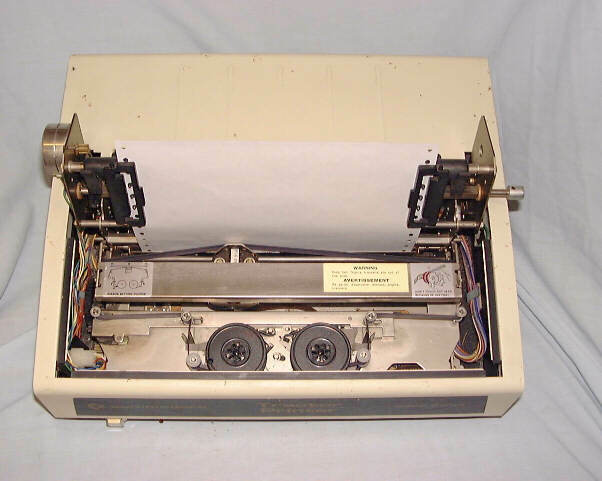 The printer with the front cover removed, revealing the ribbon spools, similar to those of a teletype or manual typewriter, rather than the cartridge used in Commodore's later models. The other difference to later versions is that the head is driven backwards and forwards by an endless scroll incised on a rotating cylinder, instead of the toothed belt drive used later. A pair of 5¼ inch full height disks in a self contained unit controlled by by its own 6504 microprocessor. 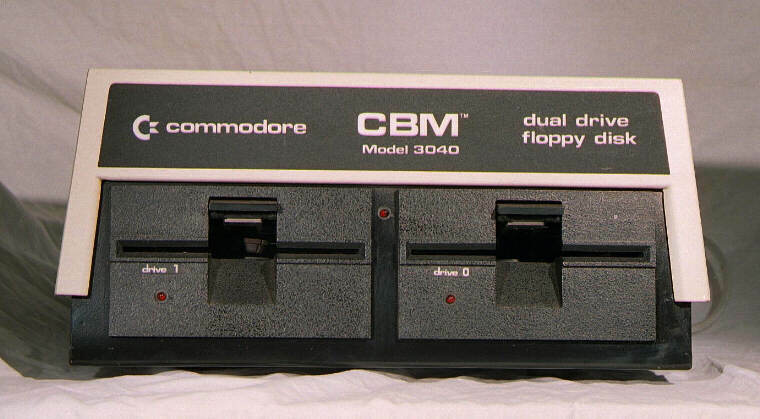 Like all Commodore peripherals, the drive was connected to the computer via the IEEE488 bus. 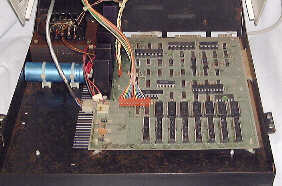 As the disk drive was controlled by its own internal microprocessor, disk to disk operations could take place within the unit, independently of the main computer. For its day, it was comparatively fast.